Wrong fuel in your Mazda? 6? 3? MPV? Bongo? 5? The Mazda I see the most of is not officially sold in this country, of course I am referring to the grey market Bongo, which for some reason gets misfuelled more often than you would expect considering the numbers on the road, I have a theory that it might be because it’s the sort of motor that gets lent out to friends or driven by people who are not always driving diesels. allas the musings of a bored fuel drainer. So you put the wrong fuel in your Mazda and you dont know what to do next. well you could either drain it out yourself or call a fuel draining company to do it, just so happens I own one and am always happy to help. Or for the motoring enthusiast allow me to give you some pointers should you wish to try the drain out yourself. 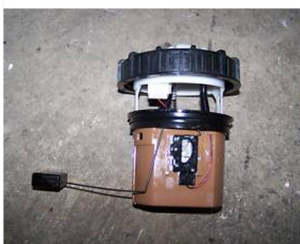 This is the sender which lives inside the Mazda fuel tank, it does 2 things, the black float sticking out is the level sensor, it sends the fuel volume reading to the dashboard fuel gauge there is also a little electric pump in this which constantly flows fuel up to the engine. There are a number of ways to drain a Mazda depending on your technical know how and confidence – and what you have available to you at the time. Rule out stiucking a garden hose down the fuel neck and sucking it dry, its not going to happen, and although it might work in movies – the yield will only just fill a molotov, – suffice to say you need to empty a tank which holds considerably more fuel than the hollywood molotov. OK, so you can intercept the fuel line as it feeds the high pressure diesel pump by attaching a makeshift hose onto it, obviously this would need to be done safely. Then either by powering the in tank pump directly with a spike to the positive wire, or by bridging the sender unit you turn on the pump and let it bleed out into your jerry rigged hose set up. or of course you could just call me, a fuel draining expert. we can attend anywhere in the uk with 45 minutes.